Our genome is the blueprint for our existence: it encodes all the information we need to develop from a single cell into a hugely complicated functional organism. Yet it is more than a static information store: our genome is a dynamic, tightly-regulated collection of genes, which switch on and off in many combinations to give the variety of cells from which our bodies are formed. But how do we identify the genes that make up our genome? How do we determine theirfunction? And how do different genes form the regulatory networks that direct the processes of life? Introduction to Genomics is the most up-to-date and complete textbook for students approaching the subject for the first time. Lesk's engaging writing style brings a narrative to a disparate field of study and offers a fascinating insight into what can be revealed from the study of genomes. The book covers: the similarities and differences between organisms; how different organisms evolved; how the genome is constructed and how it operates; and what our understanding of genomics meansin terms of our future health and wellbeing. 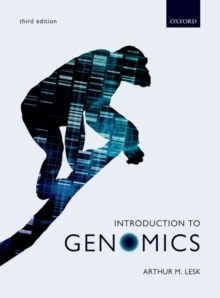 The Online Resource Centre accompanying Introduction to Genomics features: For students: - Extensive and imaginative weblems (web-based problems) for each chapter designed to give you practice with the tools required for further study and research in the field- Hints and answers to end-of-chapter problems and exercises support your self-directed learning- Guided tour of websites and major archival databanks in genomics offer a wealth of resources to springboard your own research - Journal club: links to related research articles on topics covered in the book are paired with engaging questions to improve your interpretation of the primary literature- Rotating figures allow you to visualize complex structuresFor registered adopters: - Downloadable figures from the book.